We arrived with no plans. The staff was able to assist us in planning daily activities by booking excursions, calling taxis, renting us cars, and setting up food reservations. On top of that, we would wake up and have a fresh breakfast served every morning on our balcony. Fantastic place, view, and stay. We can't think there is a better property in the area. We had a modern suite with hot tub and caldera view, room 18, and the hot tub and balcony were probably the most private in Santorini. 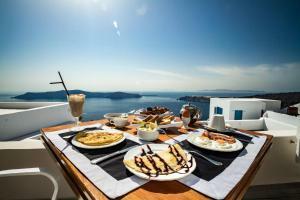 Perfect view of the sunsets, so no need to go to Oia, just relax on your balcony... I may even say they are better than Oia. Staff helped with every question and reservation we needed while on the island. Gorgeous location away from the more touristy spots in Santorini — but close enough that the other places are easily accessible. The staff at the hotel is amazing (especially Prod) who treat you like family rather than guests. Would definitely book here again. Location was good, the view of the sunset was amazing, the breakfast was great, the staff was incredibly friendly and helpful whenever we needed anything, and the room was very clean. We enjoyed our stay very much and it was a great place for our honeymoon! very good room & hotel facilities, very kind & nice staff especially Nick, very good location, perfect view, price paid is very worthy. Our next vacation in Santorini would be in the same hotel. This was my first time to Santorini and i loved this hotel, the location, amenities, staff, views, it was just amazing.. I highly recommend this hotel. The view was amazing. The transportation they arranged was very efficient and was waiting right when we get off the ferry. The staff upon arrival was very friendly. The house keeping staff was very nice and left rose petals on my daughters bed. She loved it! It was a nice touch. - Great location. 6 minute walk to bus stop. - Staff were extremely friendly, especially Chris and Lucas. - Breakfast served in our suite daily. - Personal pool outside our suite was perfect to just relax in and watch the sunset. - Perfect view of the sunset! The location of the property is outstanding. The staff are also exceptional. Lock in a great price for Galaxy Suites & Villas – rated 8.6 by recent guests! 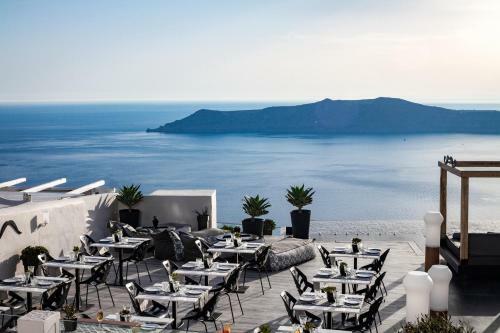 With a privileged position, on the crest of Santorini's caldera, Galaxy Suites & Villas features an infinity pool with stunning views over the Caldera, a poolside lounge area with cabanas, and a second pool with sea views. 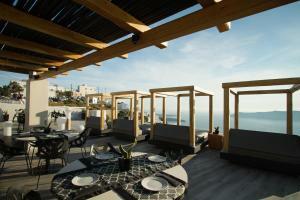 On the rooftop, guests can taste Greek and Mediterranean cuisine at the sophisticated setting of Le Mustache Restaurant. 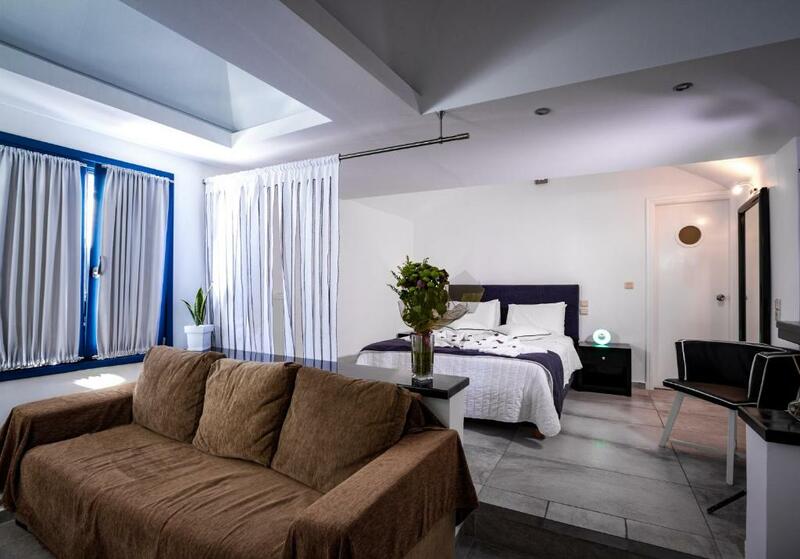 Each with a hot tub or private plunge pool, the air-conditioned suites of Galaxy Suites & Villas have an elegant Cycladic style, and a marble or mosaic bathroom. All have a Smart TV, a mini-bar and free WiFi. An a la carte breakfast, made with fresh local ingredients and including chef's suggestions, is served by the pool area or in the privacy of the guests’ rooms. There is also a pool bar, where guests can enjoy the sunset to the sounds of lounge music. Drinks and cocktails are served. Galaxy Suites is ideally located in the quiet village of Imerovigli, yet within just 1.2 mi from the bustling capital of the island, Fira. Free public parking is possible near Galaxy Suites. When would you like to stay at Galaxy Suites & Villas? This caldera-view suite features a comfortable bed with handmade mattress and a furnished balcony with outdoor hot tub. Please note that each suite differs in decoration and style. Pictures might vary from the actual due to renovations, furniture and decoration changes. Housed in an 1836 cellar, this villa has 3 bedrooms, 3 bathrooms, indoor hot tub and a sea-view porch with a private plunge pool and caldera view. Please note that each villa differs in decoration and style. Pictures might vary from the actual due to renovations, furniture and decoration changes. This suite features a veranda with hot tub, lounge chairs and caldera view. 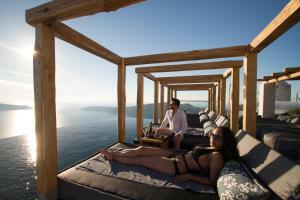 Galaxy Suites & Villas features 2 swimming pools and 4 terraces overlooking the Caldera Sea View. We are at the highest point of the Caldera - Imerovigli offering one of the best and Panoramic Sunsets in the whole island , in a quiet and peaceful atmosphere. Τhe experience completes with the local specialties restaurant, served in your suite or in the Private Dinning Area. House Rules Galaxy Suites & Villas takes special requests – add in the next step! Galaxy Suites &amp; Villas accepts these cards and reserves the right to temporarily hold an amount prior to arrival. Galaxy Suites & Villas accepts these cards and reserves the right to temporarily hold an amount prior to arrival. Please inform Galaxy Suites & Villas of your expected arrival time in advance. You can use the Special Requests box when booking, or contact the property directly using the contact details in your confirmation. Hot tub was cold, when asked the room services advised that this is the highest temp they could do which was useless. Breakfast and room dining quality is really poor and overpriced. Bathroom was smelly and water was allover the floor after a shower. Honeymoon sweet sound insulation was really poor we heard the conversations of adjacent rooms which was a bit annoying. The breakfast and baggage help service could have been better. The staff lady was nice and helpful in the reception. but the other man working there could have been more helpful. Our suite was fantastic with a prime location overlooking the Caldera. Private pool and jacuzzi were great. All the staff were very friendly and helpful. Special mention to Nikos and Marissa in reception, Leonidas ‘the man from Corinth’ at the bar and restaurant, Achilles the bringer of great breakfasts every morning with a smile and Ifana the lady who kept our room looking lovely every day, flowers and all. We’ll be back!! Efharisto! Paul, Oxford England. Strong smell of sewage but apparently it's common in santorini, hotel staff reacted quickly to clear our room. The magnificient view,Jacuzzi, 2 available pools, good healthy breakfast..fira village just 35m walk from our hotel 5m from Buddha bar. The showers in the bathroom of our villa were a little odd in that they were hand held showers - so did not attach against the wall so you could stand under without using hands. We were received by Nikos who was an absolute pleasure to deal with. He showed us everything, was very helpful with recommendations on what to do around the island (all of which we did and it was all fantastic) and even when one of our friends hurt his head, Nikos came to the rescue with some soothing salve. Nikos helped us order quad bikes and went out of his way to ensure our stay was wonderful. Thank you Nikos. We highly recommend staying at Galaxy Suites & Villas. No washroom for late flights so have to get washed in their restaurant toilets which wasnt great. The breakfast served to the room was amazing ans always on time. The cleaner was brilliant. Infinity pool was great with best views on yhe island. Rooms were lovely. 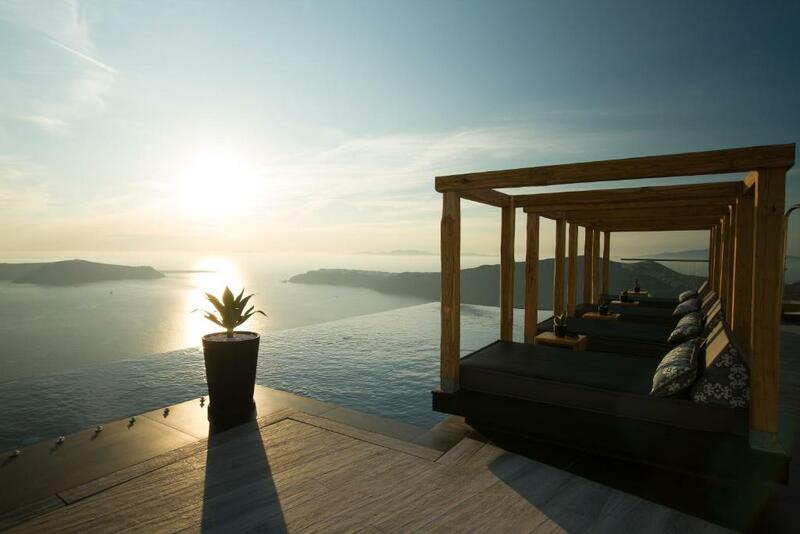 The location of the hotel is great and the sunset views are unparalleled. However, what I liked most were the staff. They were friendly and helpful. Nickos at reception did a great job and really made us feel at home. I look forward to going back next year. The view from the room was breathtaking and there is no better place in Santorini to enjoy the worldwide famous sunset!!! !Do not miss the chance to live this experience from the balcony of your room!!! The infinity pool is an other amazing spot of the hotel! The view will leave you speechless.!! !What makes the huge difference in this hotel is the excellent, professional, polite and so focus to the details staff. Nikos and Achilleas along with the rest of the hotel staff helped us to organize our days in Santorini by suggesting and recommend to us the most amazing spots/ places in Santorini!!! Overall our stay to Galaxy suites exceeded our expectations and we will be back very very soon!Thank you very much!!!! The Galaxy Suites are the perfect choice for a Santorini stay. It is in a quiet location which is focused on the most amazing view of the sunset. There are local restaurants nearby as well as a supermarket. The service is brilliant - breakfast in the room was such a treat each day. The room was beautiful and comfortable and we loved having a hot tub on the terrace. I would recommend the hotel to everyone. It was a perfect place for us. 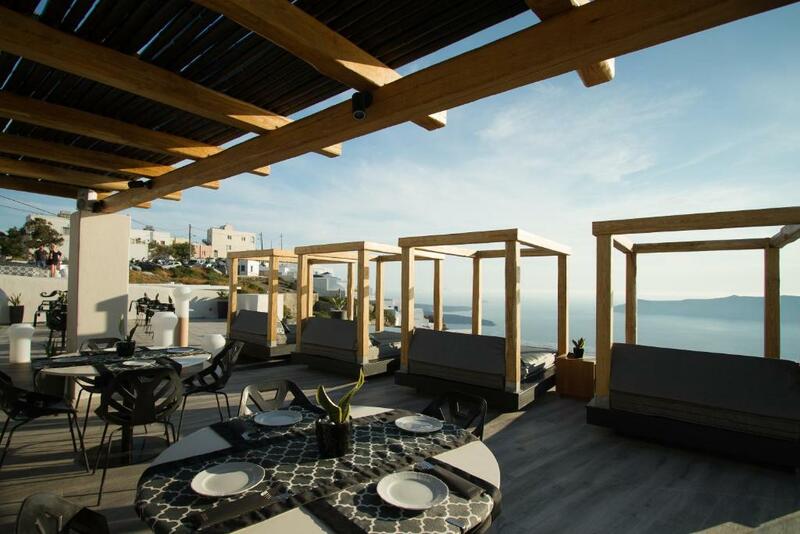 It's a bit pricey, but well worth the splurge if you want to experience cliff side Santorini.